Magi—political advisers to Kings yearned for restoration of true Persian kingship. Matthew reshaped the story known in his time. Seeing the brilliant star was not an ordinary star, but a star sign. We, too, make journeys, meet problems and other challenges. Where do we “bend to the newborn King? When do we find time to kneel before the King of Kings? 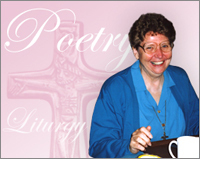 Take time to reflect on and answer the questions within the prayer poem. What do you admire most about the Magi? Why are hardships on our journeys real blessings? What kind of options might work for those experiencing hardships? Do you take time to thank and praise those who guide you on your journey? Why are the tabernacles in our churches a good place to stop on our faith journey? I especially liked the two questions in the last stanza of your poem. “What guides us? Who guides us? ” With these two questions comes the suggestion that we kneel and bow before the tabernacle. Here is a good place to ponder these questions. 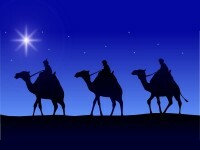 Of course the other place I will want to go is to the Epiphany crib where I can ponder and appreciate the three wise men and their journey. Thank you, Kathleen. Your suggestions of places to answer the questions are good.